Police are looking for a person of interest in connection with a wild hit-and-run crash involving a stolen Amtrak vehicle in Boston's Seaport District that left a woman injured. Boston police detectives are asking for the public's help in identifying the man, and released a photo of him on Wednesday. 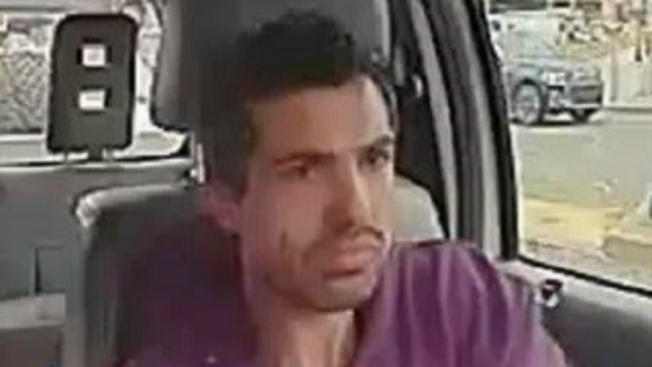 The man has short dark hair and was wearing a purple shirt. He is believed to have run away toward East Service Road. The hit-and-run, which involved a stolen Amtrak pickup, happened just before noon on March 29 on Northern Avenue and Fan Pier Boulevard. The pickup truck driver was allegedly driving erratically down the road when he hit an Uber vehicle right in front of the federal courthouse. The pickup truck continued to drive on, hitting a woman and then another vehicle and traffic light before blowing a tire. 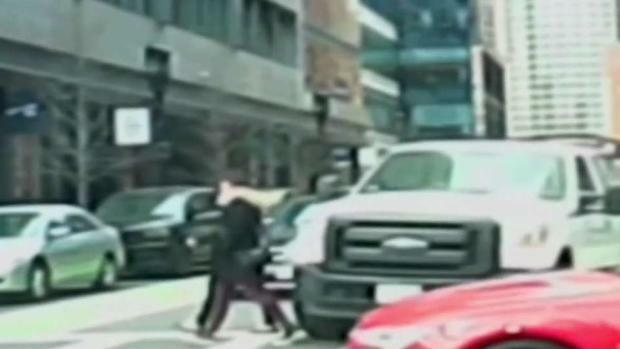 Dashcam video showed a close call for a pedestrian in Boston's Seaport District. The woman who was hit suffered a foot injury, and was conscious and alert as she was taken to a local hospital by paramedics. "A white pickup truck just sort of came out of nowhere," said Brandon Bronaugh, who witnessed the incident. "I thought he was going to stop and he was like, literally aiming for vehicles. He had no hesitancy, no reluctance, didn't pause for a second. He went directly after these young ladies, actually almost hit two more cars as he turned the corner. Very scary. Very, very scary." Barry Ryan said the pickup hit his vehicle, damaging the front end, left tire and driver's side mirror. It then sped off and demolished a street light. "It must have hit me first, bounced off me and then went over there," he said. The investigation into the hit-and-run is ongoing.